Most camper forms can be accessed using your CampInTouch account after you have registered for camp. As we post new forms to fill out, we will notify you that they have been placed in the forms section of your account page. To the right, you can see a simple guide for filling out forms in CampInTouch. To learn more about uploading forms, requesting special forms, or other functions, scroll down. 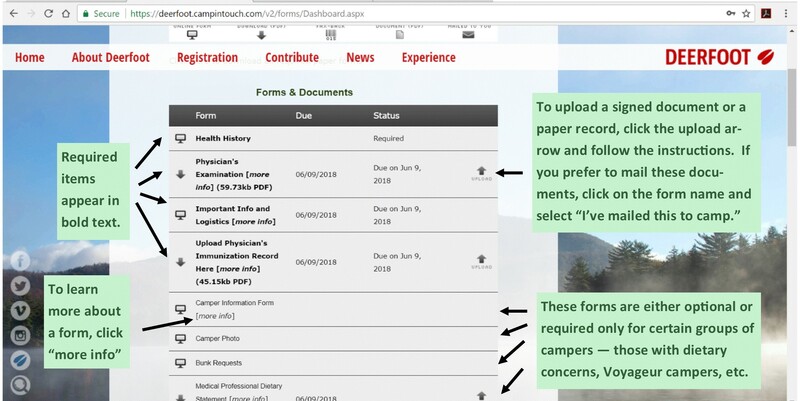 To upload completed paper forms, simply click on the icon labeled “Upload” on your CampInTouch Forms page (see image above). You will then be prompted to upload the form as a PDF. In order to do this, you will need to scan the document using a scanner, or using your phone. To scan using your phone, there are many free apps you can download which utilize your smartphone camera to create a PDF image of a document. GeniusScan is one example, but there are many more. It is also important that when you upload the file, you include all the pages as one PDF. If you have scanned them as separate pages, simply use the “Combine Files” function in Adobe Acrobat, or use an online merge tool like the one here: https://smallpdf.com/merge-pdf. Deerfoot food is served “family style,” which makes it challenging to accommodate dietary restrictions. We will work to accommodate restrictions based on medically-diagnosed food allergies (a licensed physician’s signature is required-MD, DO, PA, or NP). We cannot accommodate dietary preferences such as Kosher, vegetarian or vegan diets, etc. If your son has a food allergy, please complete the “Medical Professional Dietary Statement” and “Parental Statement on Dietary Needs” forms (contact the Deerfoot office at 855-447-2267 Ext. 1 or by emailing stephanie@deerfoot.org to request these forms). These forms include the information necessary to accommodate your son’s allergy. It is very important that we receive this information at least four weeks prior to the start of the session. To avoid confusion, these forms are handled via email, fax, or post; separately from CampInTouch.